Adding a patio to your London garden can be the perfect way to mix things up and make your garden look fresh and new without having to worry about how you're going to take care of it. Whether you dream of having BBQs and summer parties on your patio, or just want to keep it to yourself, an oasis in the sun, patio paving is a great way to do it. One of the best things about having a patio laid is that there are so many options; depending on the size of your garden you can have partial garden patio paving, or have the whole space done. Whatever you choose, with our London based landscaping services, you are guaranteed excellent results. Are you planning on paving your patio? For many families in London, having a paved patio is the best way to enjoy their garden, and if you are looking for experts in patio design and construction in London, our gardeners at Handy Gardeners have the expertise to help. We have been offering garden design services to residents in London for many years, helping individuals and families get the most out of their outdoor space. With a long history of excellent designs, outstanding customer service, and unbeatable prices, it's no wonder our customers choose us. We are also able to offer the widest range of patio related services, alongside the expertise of our garden landscapers, who can help you decide on the overall design of your garden, as well as the right patio slabs and layout for your needs. When helping you design your perfect patio, we will work with you to understand what it is youwant, and how to achieve it. Your garden dreams are what we are here to create, so just get in touch with our team to tell us what they are. 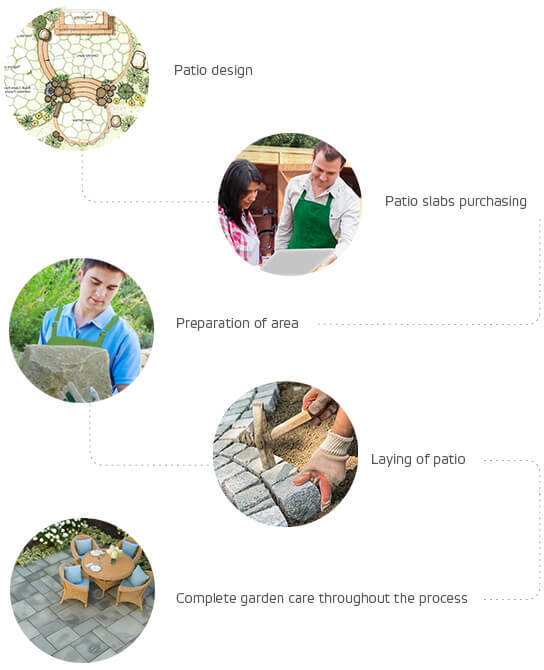 What's included in our patio paving services? Hire us and save yourself the hassle! Whether you need our London gardeners to lay a patio for you, or want some help with patio cleaning, our expert team at Handy Gardeners can help. And all you need to do in order to access our cost-effective and reliable patio services is give us a call on 020 3744 0111 today, let us know what you need, and book your appointment. We'll handle the rest!